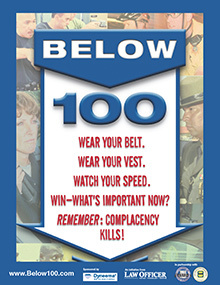 Procedures for carrying out a suicide bombing are not necessarily as simple as being willing to strap oneself with explosives or drive an explosive-rigged vehicle and then plunge into the enemy ranks. There is often also some bureaucracy behind the process, as has been attested in the case of the Islamic State. This point similarly applies to the Syrian jihadist group Hay'at Tahrir al-Sham (Liberation of al-Sham Commission: HTS), a successor to Jabhat al-Nusra, which was Syria's official al-Qaeda affiliate. 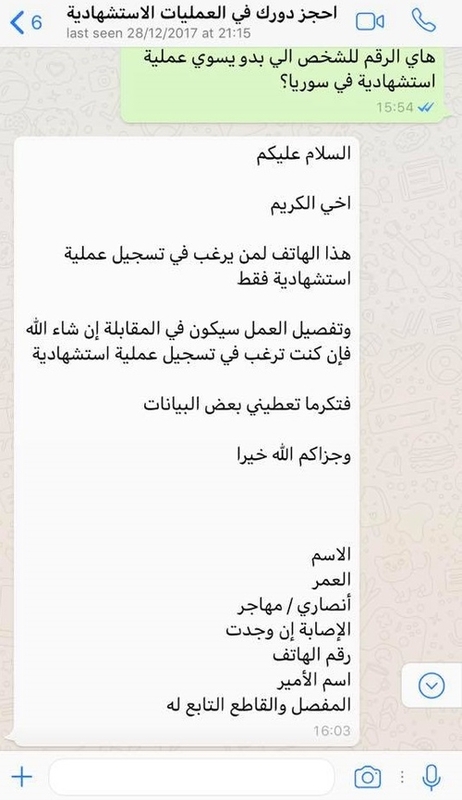 In late December 2017, I found a post on the Telegram channel of HTS official Abu al-Yaqdhan al-Masri, an Egyptian jihadi who had been in Ahrar al-Sham but left the group over disagreement about the Turkish intervention in north Aleppo. Abu al-Yaqdhan's post featured the social media graphic below. 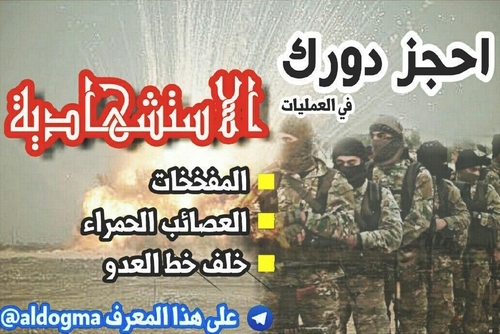 The graphic offers the chance to acquire a role in suicide bombings via contact with a Telegram account. For context, the term 'martyrdom operations' is used by jihadist groups to refer to suicide bombings, while the term 'red groups' seems to refer to commando operatives of HTS. 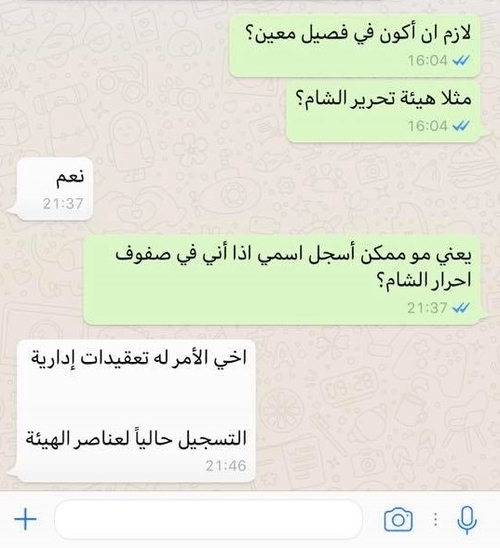 Besides the Telegram account @aldogma, a WhatsApp number with a Syrian dialling code was also offered for contact. I simply contacted this number without saying anything about myself personally with the goal of understanding the procedures. I feature the messages below (explanation of any terms in square brackets). Q: Is this number for the person who wants to do a martyrdom operation in Syria? A: As-salam alaykum. Dear brother, this phone is for the one who desires to register a martyrdom operation only, and detailing of the work will be in an interview if God wills. So if you desire to register a martyrdom operation, please give us some details. May God reward you best. Q: Do I have to be in a specific faction like HTS? Q: So it is not possible to register my name if I am in the ranks of Ahrar al-Sham? A: Brother, the matter has administrative complications. The registration is currently for members of the commission [HTS]. On social media, it is also possible to find a variety of phone numbers one can contact for recruitment in HTS, though the windows of opportunity for contact and inquiry may be limited. These methods of recruitment merit further investigation.